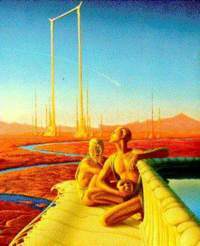 The Martian Chronicles is a science fiction novel by Ray Bradbury1 (1950) which has something of the dark, psychological character of Lem's Solaris. Even at this late stage, Bradbury was still able to tap into the Lowellian, golden-age myth of canals and intelligent Martians, even though he and presumably most of his readers knew that the real planet Mars appeared incapable of supporting anything but the most primitive forms of. Bradbury's main goal, however, is not astronomical accuracy but to contrast the "graceful, beautiful and philosophical" Martians, and their love of the aesthetic, with technology-obsessed humankind. Thus he explores how civilizations and intelligence elsewhere might have developed along completely different lines (see extraterrestrial intelligence, more advanced than us). 1. Bradbury, Ray. The Martian Chronicles. New York: Doubleday (1950).